A lecturer at Bangor University has been rewa Jane Wright receiving her Award. 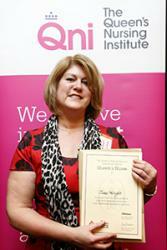 : credit Kate Stanworthrded for her outstanding community nursing by receiving the title ‘Queen’s Nurse’. Jane Wright has received The Queen’s Nurse Award, which comes with the Queens’ Nurse title, from the Queen’s Nursing Institute (QNI). A registered charity which has the Queen as its patron, the Institute is dedicated to improving the nursing care of people in their own homes and communities. Jane Wright, who works at the University’s School of Healthcare Sciences has a district nursing background. The Award recognises both this and her role in educating the community nursing workforce and the community nurses of the future. In addition to her role, teaching future nurses, she also works with district nursing, school nursing and health visitor teams focussing on north east Wales, to support their role as mentors providing clinical skills education and training for undergraduate and post-graduate students on practice placements. With her expertise and experience in district nursing, community healthcare and social policy, Jane is currently completing research for a National Institute for Social Care and Health Research PhD scholarship, examining how Stroke best practice guidelines can be tailored for implementation in the care home setting. This research venture was completed in partnership with north Wales care homes. Bangor's School of Healthcare Sciences is currently recruiting Nursing students for the March and September intakes at both the Bangor (Adult Nursing, Learning Disability Nursing, Mental Health Nursing) and Wrexham (Adult Nursing, Children's Nursing) Campuses. The School has close links with a number of health boards, offers learning and clinical practice opportunities through the medium of Welsh and has a 98% employment rate for its graduates so is a popular option for those looking for a clear employment path in this time of economic uncertainty.